OWIKAR Solar Power Water Pump, 7V 1.4W Fountain Birdbath Pump Floating Floating Drifting Panel Pool Pond, Reach Up 45 cm, Solar-powered for Pond, Pool, Garden, Fish Tank, Aquarium | Fountain City Art Ctr. The pump will start automatically in 3 seconds when sufficient sunlight gained. 1.For the first time use,you need to submerged the whole water pump(including the nozzle) and let it spray in the water to push air out and let it go.With this operation,the water can be ejected higher. 3. Do not make the pump work without water for a long time, or its lifespan will be shortened. 4. Clean the pump regularly. If it is dirty, it will stop working. 5. Max water-jet height 45cm needs to be reached at fierce sunlight. So usually the height lows than 45cm. 6. Be careful when use it. And do not let children play with it. 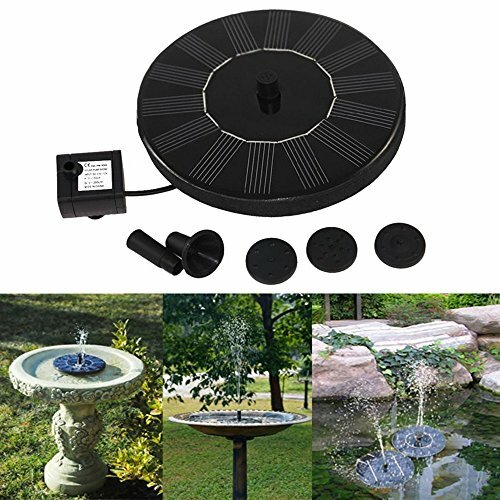 Minimum water depth in fountain should be 1 3/4",Maximum water height: 18",Regular:10~15"
Note: As the pump is solar powered, the water height may compromise when compared to electric water pump. Please clean the nozzle regularly to get high spray effect. Suitable for bird bath, fish tank, small pond, garden decoration, water circulation for oxygen, etc. View More In Replacement Parts & Accessories.